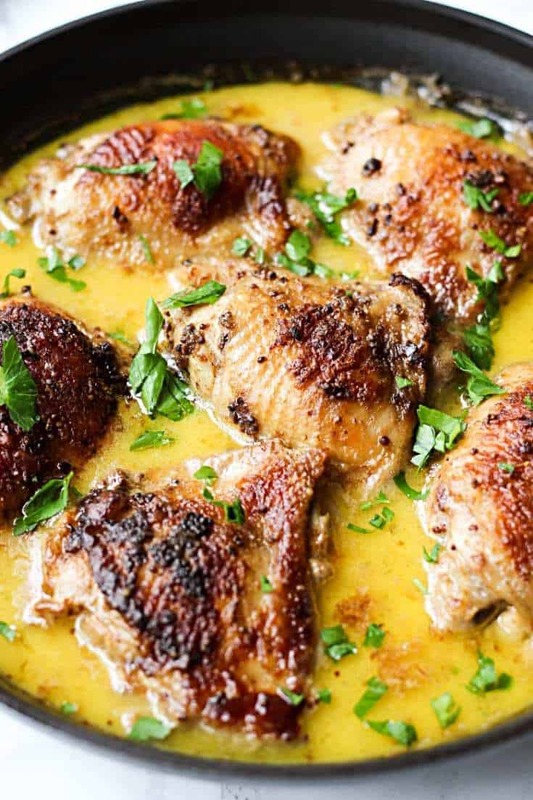 Prepare to fall madly in love with this Creamy Dreamy Mustard Chicken Recipe. Classic French dish that tastes outstanding. Friends, this is going to be a long post, but I get lots of questions so I try to add plenty of information to help you make the best Mustard Chicken ever! Just check the Video Tutorial above the recipe card to see what I mean. I don’t mean to brag, but this is it. Forget everything you knew about creamy chicken dishes and listen up. I’ll be honest with you, I’ve tried many chicken recipes before, the way too many. And I can tell you the characteristics of a deliciously cooked chicken. Now, imagine a perfectly braised falls-off-the-bone chicken swimming in a creamy and flavourful mustard sauce. It’s too irresistible and the words cannot even describe the deliciousness of this recipe. I said this before and I’ll say it again. French folks sure know a good food. I was lucky enough to experience a delicious food galore when I visited this beautiful country in the mid of 2000s. French recipes are unique, often very simple and absolutely mouthwatering. Funny though, back then, I didn’t try Dijon Mustard Chicken. I was too obsessed with their French Onion Soup, cheese and seafood. Can you blame me? But ever since I started a food blog, I’ve been dreaming to make recipes from all over Europe. Being in love with French cuisine, I couldn’t leave Mustard Chicken recipe without proper attention. French call it Poulet à la Moutarde. Feeling fancy? Call it that way too. You’ll spend the most of 15 minutes browning the chicken and onions. Oven will do the rest while your mouth waters from a great depth of flavour coming from the oven. This is definitely one of the best one pot recipes. To make it, I recommend using a Dutch oven. This is the Dutch Oven that I use these days and I’m absolutely in love with this pot. Be prepared to get your hands dirty. Because the mustard sauce comes out so good, you can’t help, but finish the last bits of it before you leave the table. Can I Substitute Chicken Breasts for Chicken Thighs? You can use chicken breasts instead of thighs. There is one thing to keep in mind. Boneless skinless chicken breast cooks faster than bone-in and skin-on chicken thigh. To make sure chicken breasts remain juicy, cook them in the oven no more than 25-30 minutes or until internal temperature reaches 165F. That’s where instant meat thermometer comes in handy. Can I Make Mustard Chicken Ahead Of Time? Parts of the Mustard Chicken recipe can be prepared ahead of time. I recommend sautéing the onions and preparing the sauce 1 day in advance. Store it in the airtight container in the fridge. On the day when you’re ready to serve the dish, brown the chicken, add it to a sauce and finish everything in the oven. How Can I Make This Mustard Chicken For A Large Group Of People/Party? I’ve been making this recipe for years but I never actually thought how to make a batch of it. But then Thanksgiving 2018 happened and we hosted a party for a large group of family/friends. Mustard Chicken was the main dish, and there was no way I could fit 16 pieces of chicken thighs into my Dutch Oven pan. 1. Working in batches I seared all chicken. To speed up the process I actually used two pans but this is optional. 2. Next, in the same pans I sautéed the onions and prepared the sauce. 3. Finally, I put all chicken in a large rectangular baking dish, poured over the sauce and baked according to recipe instructions. How can I substitute Creme Fraiche? My quickest and easiest solution is to use the combination of heavy cream and sour cream in equal proportions. So if the recipe calls for 5 tablespoons of Creme Fraiche, you would use 2.5 tablespoons of heavy cream and 2.5 tablespoons of sour cream. 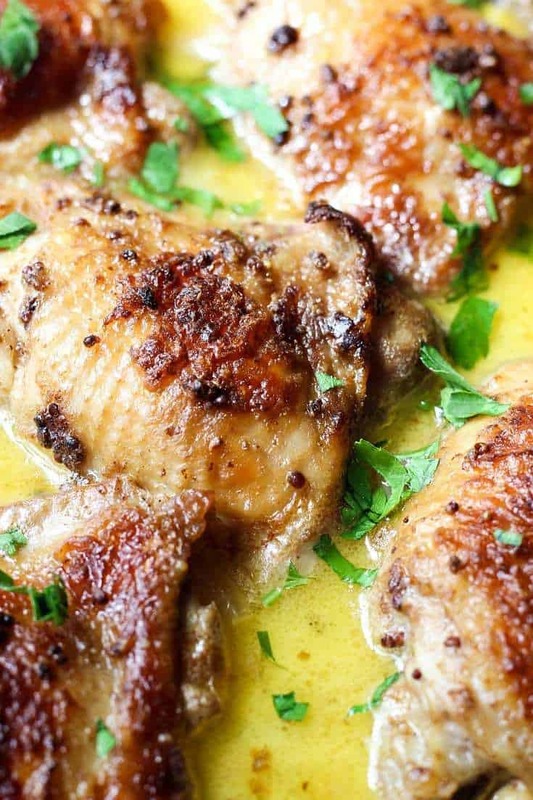 What To Serve With Mustard Chicken? White Rice – simple and quick side dish that goes really well with saucy and creamy Dijon Mustard Chicken. Honey Mustard Chicken – another easy one skillet meal your family will love. Friends, if you like this recipe, snap a picture, click on the PIN above and post your photo there. I love seeing your creations. Recipe Video Above. 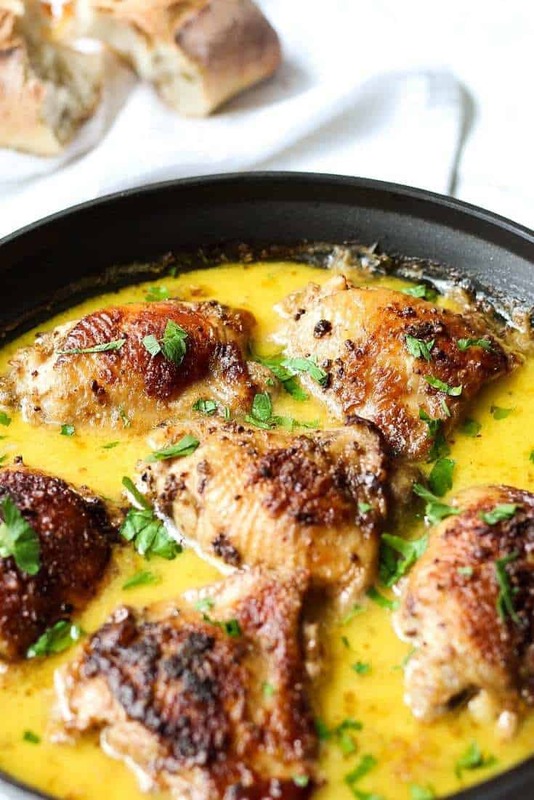 There's a reason why this Mustard Chicken Recipe has been my READER'S FAVORITE for years. Creamy, flavorful and that mustard sauce is super addictive! The whole recipe is prepared in one pan. You're gonna ask for seconds! Season chicken with salt, pepper and rub with both mustards. In a Dutch oven or big oven-proof skillet melt butter on a medium high heat. Add chicken and brown from both sides, about 4-5 minutes per side. Transfer chicken to a plate. To the same pan add shallot and onion and sauté for about 5 minutes until translucent. Add chicken stock, scraping the brown bits off the bottom of the pan. Add thyme and bay leaves and bring a mixture to a boil. Stir in Crème Fraîche and return chicken back to the pan. Cook uncovered in the oven for 50-60 minutes until chicken is completely cooked through and no longer pink in the middle. Garnish with parsley and serve immediately! Don't forget to grab my free European Comfort Food Ebook. Recipe is adapted from No Recipes. If you make this Mustard Chicken Recipe, don’t forget to snap a picture and post it on Instagram with a hashtag #lavenderandmacarons. I’d love to see your creations. I love this recipe as is. But I also make a Whole30 version; I use coconut cream instead of the creme fraiche. I serve it with mashed potatoes and roasted green beans. How do you think this recipe would taste if I used the truffle honey mustard from Trader Joe’s instead of the Dijon?? Yes, you can definitely try that. The final dish would just have a lovely honey and truffle flavor. Hi! After reading the reviews i’m really excited to try this for a dinner party i have coming up but we don’t get fresh thyme where i live. Is it ok to substitute with dried? And would i do it in the same quantity? This recipe is delicious! I made it exactly how you stated except I only had Chicken Tenders on hand. It worked, I ended up only slightly browning the chicken tenders and not fully cooking until the oven did the rest. I put the pan with the tenders in the oven for only 10 minutes to fully cook. It was delicious at the end anyway. Next time I will try the full size chicken pieces to get the browning/crispy effect, it will just make it better! Thank you! Joelle, thank you for your lovely review! I’m happy you liked the recipe. Using chicken tenders would definitely speed up the process and it’s a great idea especially if dinner needs to be cooked asap. Hi Michael, I’m surprised heavy cream is not available in France. On the other hand, you’re lucky because seems like you have all the necessary ingredients. Here, in the US Crème fraîche is not available in many grocery stores, so sometimes we have to use alternative ingredients. Just made it a lunchtime, it was awesome! I used chicken breasts, added a clove of garlic and cooked it in a casserole dish with some mushrooms and pre-cooked potatoes. Dead easy. Methinks a little white wine might work in it too. If I’d thought ahead I’d have cooked it all in a skillet and lobbed it into the oven and it would have been a one-pot. Pinned. Michael, thank you for the lovely comment! I’m so glad you liked this Mustard Chicken! Yes, wine works in this recipe too. Probably 1/2 cup would be a good amount. Pairing with mushrooms and potatoes makes for a complete dinner. Heavy cream might be called creme entiere at the grocery in France. It will have a higher fat content. Cream is in the dairy case in France. This is easy to make and fantastic! It could hardly be better! Thank you for your comment John! I’m very glad you liked the recipe! Hi there! Sorry for a late reply! Yes, you can use skinless thighs. If they are also boneless thighs, I would cut the oven cooking time to 25-30 minutes. If you have an instant meat thermometer, it should read 175 F. I wouldn’t cover the pan. Hope this helps. Susan, I honestly haven’t tried substituting with either of those. But I did a little online research and here’s what I suggest. If you’ve ever cooked with goat yogurt and know how it behaves in cooking, you can try using it in the recipe. However I’m afraid it might curdle in the oven. I personally would rather use a full fat coconut milk (that is sold in cans). It has more fat content than almond milk, it is often used with chicken recipes and in my opinion would be a better substitute for Creme Fraiche. I hope this helps! Let me know how the recipe turns out. I have made a lot of chicken, but this is probably number one or two on my list. I didn’t have creme fraiche, so substituted some heavy cream. Used three breasts and three thighs (all bone and skin on). If anything, I would add a little more mustard next time. Combined with the rosemary it was incredible. We couldn’t get enough of the sauce and onions. Had one piece left and sent it to my daughter’s house. She emailed me and said she had to have the recipe. It’s that good. I’m happy to hear your daughter liked this Mustard chicken. It’s one of my family’s favorite recipes too. So my husband does not like thigh meat… How would boneless skinless breast work? Jamie, you can definitely use chicken breast. There’s just one thing to keep in mind. Boneless skinless chicken breast cooks faster than bone-in and skin-on chicken thigh. To make sure chicken breasts remain juicy, cook them in the oven no more than 25-30 minutes or until internal temperature reaches 165F. Mustard is one of my favourite sauce. this looks tasty. I am definitely trying your recipe. Thank you Riya! Mustard makes all the difference in this recipe. What wine would you recommend to have with this dish? Hi Susan! My suggestions would be Pinot Noir, Merlot, Kendall Jackson Chardonnay or Chianti Classic Red Wine. This looks amazing without a doubt making this recipe! And will make it with rice as you did. The sauce on top of the the rice must have been amazing!! Have you made this recipe with chicken breasts before? I would imagine the breasts would also be great but I love dark meat so maybe one day will make it with the thighs and then another day with breasts. Thanks for the recipe Iryna. There seems to be a huge quantity mustard per thigh so how does browning the thigh work? Would it not be better to brown the pieces first, then put on the mustard and then cook it? I will be making for 6 people with seconds in mind! Hi Bev! Browning chicken coated in this amount of mustard is essential for getting that rich mustard-flavored sauce in the end. You don’t need to worry about chicken tasting sour or too “mustardy”. In fact, combination of mustard, creme fraiche and chicken broth create a super delicious sauce that no one is even going to guess what is it made of. 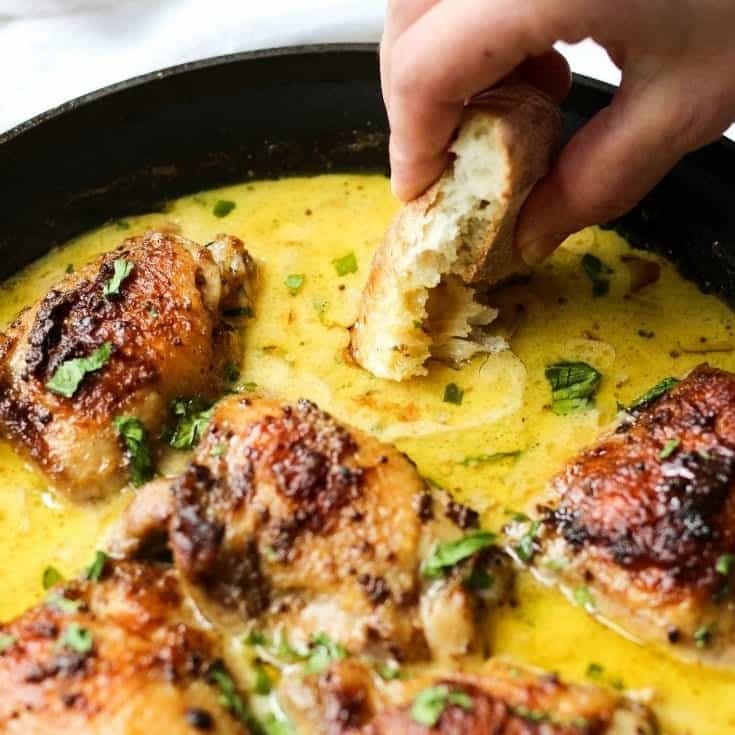 I absolutely love using Dijon Mustard on chicken when I make it for my family – they go bananas for Dijon flavored recipes and i’ve been doing my best to find more! Definitely going to try making this one at home! Thank you for sharing! Thank you for the comment Billy! I think you’ll like this recipe. Mustard is not overpowering yet adds an awesome flavor to the dish. My family loved this! Any thoughts on preparing any part of this recipe ahead to serve for guests without spending too much time in the kitchen during party? Thank you so much! Hi Holly! I’m so glad you liked this recipe. I think you can marinate the chicken and saute the onions with chicken stock and creme fraiche the day before the party. And when you’re ready to finish the whole dish, just brown the chicken, pour the sauce over it and braise it in the oven. Hope that helps! I’ve never eaten a chicken likethat before, but I will definitly do now. Thank you for hsaring this mazing recipe with us. Great chicken recipe, I will definitely try to cook this tonight, looks great. Thank you for sharing this amazing recipe with us. I made this recipe a few weeks ago. It was very good! The whole family enjoyed it. I did however change a few things. I was making a larger amount than the recipe calls for so obviously I used more ingredients. I also added mustard into the sauce just because I love mustard and felt like a recipe called mustard chicken should have more.? I also used sour cream because it’s what I had. It worked perfectly with no curdling whatsoever. (It wasn’t low fat) I’m making it again tonight! ? My only ‘”criticism” would be that the picture is deceiving. I was hoping for that beautiful yellow and it was more of a gravy brown instead. Delicious none the less! Thank you Mandi! I’m so glad you liked the recipe. It’s one of the favorite chicken recipes in our house too. Adding more mustard into the sauce seems like a great idea especially if you love mustard. I’m sorry that your sauce didn’t come out as yellow. I’m not sure what could be the reason. Maybe next time you make it, the color would be similar to the one on the photos. It’s a soured cream, that has more fat content than a regular sour cream. You can substitute creme fraiche by taking sour cream and heavy cream in equal proportions. My very picky husband ate every bite and went for seconds. He kept commenting on how good it was and said the only thing that would make it better is mushrooms. This is a keeper, thanks! I’m very glad to hear that Nikki! This recipe is one of my favorite as well! I’m sure mushrooms would be a great addition too. Hi, thanks for the recipe. Am I reading this correct in that the only time mustard is used is prior to browning the chicken? Yes, mustard is used only one time in the beginning. I made this last week and my family loved it. I’d like to make it for a bigger group this weekend. Do you know how doubling the recipe would affect the cooking time? Thanks Emily! I’m glad your family liked it. Sorry if my comment is late, I didn’t access to my laptop over the weekend. I think 60 minutes should be good. You can also check if the chicken is ready with internal thermometer if you have it. The temperature should be 165-170 F at the thickest part of the meat. Can I use sour cream or do I have to use creme fraiche? Would it be okay to substitute without being too noticeable? I think the sour cream itself will not work since it tends to curdle when heated. Creme fraiche has more fat content, so if you mix sour cream with cream in equal parts, that should do the trick. Do you cover the pan when it goes in the oven? No, I don’t cover. That way, the chicken skin comes out crispier.